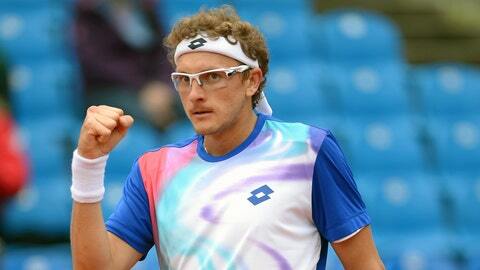 Denis Istomin celebrates winning his match against Philipp Kohlschreiber. Two-time former champion Philipp Kohlschreiber was knocked out in the first round of the BMW Open after losing 7-5, 2-6, 6-4 to Denis Istomin on Tuesday. The 55th-ranked Istomin saved 11 of 14 break points to win in just over two hours, setting up a second round meeting with Australian Marinko Matosevic. It was the Uzbek’s third win in three matches against fifth-seeded Kohlschreiber, the 2007 and 2012 tournament winner. There was further upsets when Germany’s Jan-Lennard Struff defeated sixth-seeded Feliciano Lopez 6-3, 6-4 and qualifier Thomaz Bellucci beat No. 8 seed Ivan Dodig 7-6 (0), 6-4. Spain’s Albert Ramos defeated former world No. 1 Lleyton Hewitt 6-7 (6), 6-1, 6-0 and will next face Andreas Seppi, the only seeded player to survive the first round on Tuesday. The seventh-seeded Italian defeated Germany’s Michael Berrer, 6-3, 7-5. Also, Martin Klizan eased past Dudi Sela 6-1, 6-2 to set up a second round clash with No. 3 seed Mikhail Youzhny, and Juergen Melzer beat wild card entrant Alexander Zverev by the same score. Ukraine’s Sergiy Stakhovsky rallied after losing the first set to beat German wild card Peter Gojowczyk 3-6, 6-4, 6-1.